This is an AAR of the Final Game of the Patrol: Angis 2nd Annual Tournament held at ArctiCon 2019. 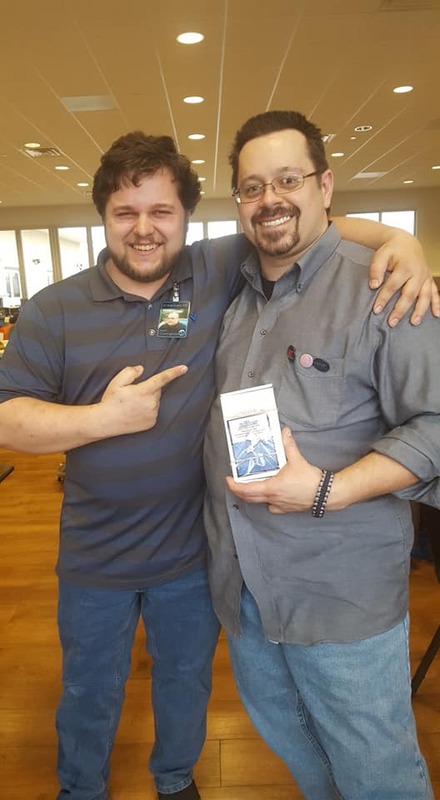 ArctiCon is a charity gaming event in Merriville, Indiana (USA). This year, proceeds from the event culminated in over $4000 to support military veterans. Prydian Army – In spite of the best efforts of the Prydian forces, it appears that the Shia Khan have managed to access one of the once thought lost Damascus Portable Castle “Vigilance”. Inside it’s broken and overgrown hull are a score of artefacts recovered from the Dolos Cloud by the Starvaulters. Artefacts that could drastically aid the Prydians in their effort to repel the Khanate empire. Khanate – Generally speaking, there is little the humans possess that the Khanate covet. Their armour is clunky, their weapons crude, their battlesuits inelegant. However, they do have a knack for discovering things long thought lost to time. In this case, a Proauctor Metaborg, long dormant and in near pristine order. Should it fall into the hands of humanity, it might cause a problem in the future. 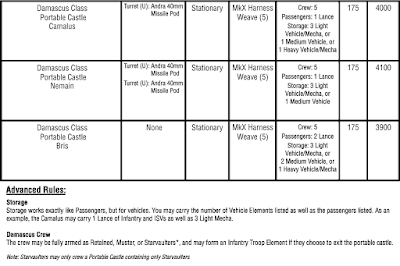 Prydia (Dave) – Have a Troop Element inside the Portable Castle by the end of Turn 6. This will give reinforcements time to vector in on the location of the Vigilance. 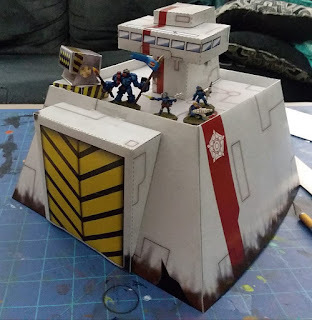 Khanate (Aris) – Prevent the enemy from occupying the Portable Castle, doing so will allow for an extraction of the Proauctor before the humans can reach it. Fire Missiles, (hopefully…) – The Anda Missile pod appears to possibly be in working order. 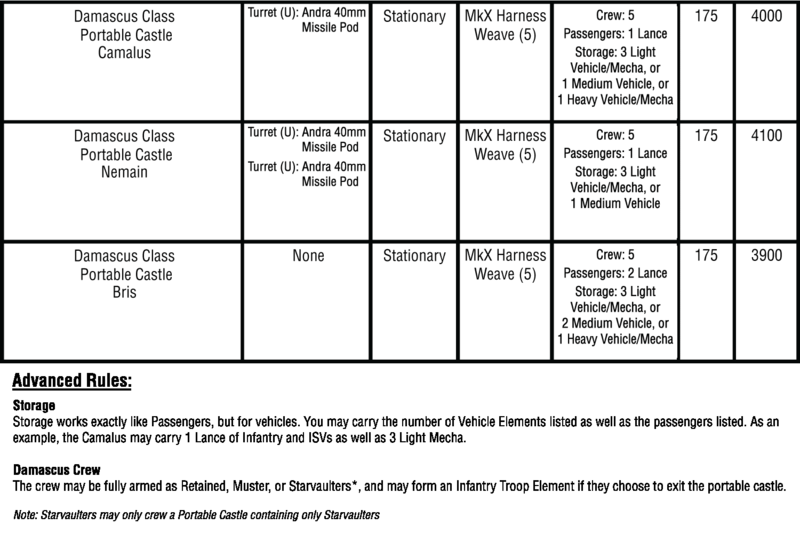 Any Troop Element within the castle may spend an action to attempt to fire the Anda pod. This pod may fire indirectly, as if it had a spotter on the target element within range. 1-4: There is a malfunction, the missiles fire straight up in the air before crashing down on the castle. 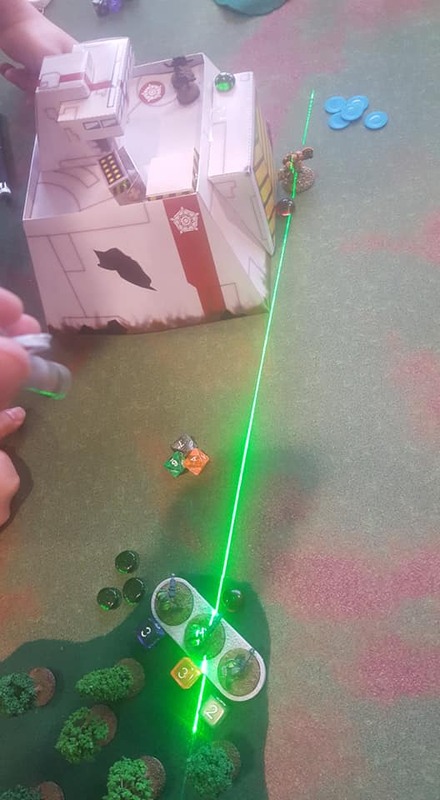 All Elements in or on the castle take an Anda Missile attack (roll for hits and kills as normal). Note: No matter who one initiative, each player chooses their own casualties for this attack. 5-8: The pod fires normally, treat this as an Anda Missile Pod attack that has a Spotter for IF. Turn 1: Aris questions his life choices. 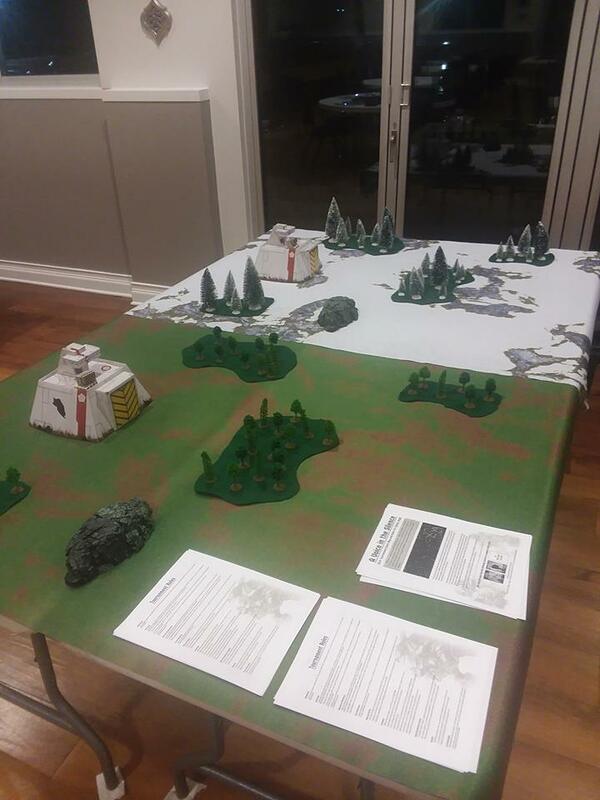 Aris set up his troops in a gamble so that if he won initiative, he would be able to drop an overwatch on his Legionary Support troops sitting on the Battlement platform with their Atomic Destabilizers, allowing him to snipe at the large Prydian element that would be coming up though the woods on the western side of the board. Aris did NOT win initiative. Dave opened the game with a solid round of fire, quickly reaping the entire Support element. Aris opt to spend the two activation tokens he had given the squad to save two of them. 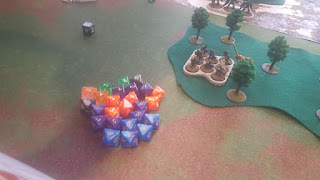 Dave would follow this up on his next turn by firing an extremely well-placed shot from his Desteria just pasted the edge of one rocky hill, and inside the edge of Castle’s missile pod on the eastern flank, killing the Khanate force commander’s element. Worse still for Aris, his Psychoborgs were A.I. Slaved, which meant they were effectively dead for the rest of the game. By the end of Turn 1, Dave had successfully taken out 6 Legionaries, 2 man Command Element, and 3 Psychoborgs. After much debate in the highest chambers if military thought, it was generally agreed he was speaking of his well known prowess in close combat. This would later be refined to “if you must enter close combat, strike without mercy”, this is also known as The Pompous Doctrine. Dave showed a prime example of this at work. 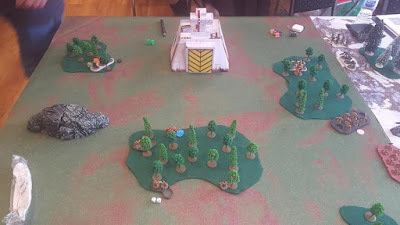 Dave’s Duxis with Assaulter and Brawler entered into close combat with Aris’s Legionnaire troop element, resulting in 27 kills on an 8 man element. There were no survivors. Things were getting dicey for Aris, so he opt to put his future in the hands of dice. Inside the portable castle was an element of Pioneers. The shock troops of the Khanate empire. With one activation token, they activated the Anda pod. Aris targeted the Retained knights that were threatening the western flank, and rolled his dice. The dice came up as a 5, barely a success, but Aris was not going to complain about this long overdue luck. 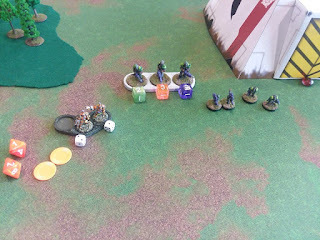 The pod fires, taking out half of the Retained knights, and locking them down on a failed moral check. Little victories for the Khanate, but this was far from over. Dave had read about Warlords. He knew they were big, he knew they were a match for Duxis, but he had never experienced fighting one yet. Dave’s Desteria were about to experience these giants of the battlefield first hand. Dave moved his Desteria though the woods into a forward position, he had a few things going for him. First, he was in cover, that +3 would be good to him. Second, They were Desteria, their armour was solid as one could hope for. However, he moved them into the range of warlords sitting in Overwatch, and Hell itself fell upon the brave Desteria. Shots from Mars, Helios, and Juno cannons were nearly suppressed by their armour but it still took Ablative Armour, all the activation tokens, and the luck of having won initiative to save what little remained of the element. Turn 4 saw the formation of the late game linchpins. The Warlords were single handedly holding the entire eastern flank, while the Duxis and the remnants of the Retained element moved to get closer to the castle. Eventually the Prydian forces in the west made a hard move to press the Castle wall, not quite able to enter it, but preparing themselves for the fight. Aris opt at this time to pull his full, untouched, element of Pioneers to the battlements, and began raining down Maia rounds down upon the Retained. This would further thin the number of Retained to a mere two; and take out almost all of the Pioneers in the process. The turn would end with the Prydian force commander deep in the woods, Warlords sitting in overwatch, and all that remained of both forces hugging the wall of the castle in a back and forth firefight. Dave had to place all his bets one one big play: Get the Retained inside, open the hanger doors, and get the Duxis inside and clean house. It was a suicide mission for the two remaining Retained, however, it was his best shot to win the day. The slug fest had hit him hard, but his Duxis was unharmed, and as hard as he had been hit, Aris had been hit even harder. … and into the line of fire from the warlords waiting for him. With inhuman roars the Warlords lived up to their name. The Duxis stood no chance against the onslaught of energies and ballistics being thrown at them, and like a tragic hero of old, it and its pilot died at the brink of it’s goal. The force commander of the Prydian forces then decided to make a strategic withdraw. There could be no victory here today, the Pryidan forces had fallen, and whatever treasures may have been within the ancient hold of the Vigilant, would fall to the hands of the Khanate Empire. Dave would walk away from the event with a brand new, fresh off the factory floor, Laan type Magog, as well as a complementary line of his very own set of Happy Burger Bots from our wonderful sponsors at Happy Burger. Remember: Happy Burger is the Fasted Food in the Universe! I look forward to another exciting event next year, and hope to see you guys there! As you have seen in the pictures the portable castle was on the table and so here are the links to download for free (just click and save to your device) the PORTABLE CASTLE and a DAMAGED PORTABLE CASTLE. We hope you enjoyed reading this as much as we did playing Patrol Angis. I’ve been playing competitively one war game or another since I was sixteen and this was the most brutal, bloody, nail biting, and most importantly: fun game I have played to date. Very wonderful read through, and definitely a challenging opponent in our Gamemaster! Looking forward to a rematch and followup, and definitely looking forward to creating a campaign to retake that portable castle... and the world! It was a fine day indeed. In the re-match you may well win! "27 kills on an 8 man element"
I assume the author meant kills in terms of the dice rolls which is possible despite 8 man element. That said it was a mad day! Is PAngis always this bloody and decisive? It is a fast and tactical game which rewards cover and timing. Caught in the open you are likely dead. Using Warlords and Duxis along with infantry will make it more deadly.